By the mid-1960s, though, television sets had permanently taken over many of the corners where the Christmas trees used to stand. So there was no room for Christmas villages around the tree. 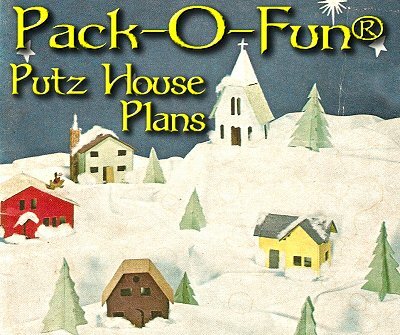 Most families stopped getting their putz houses out of the attic every year, and demand for new putz houses disappeared. Soon they became virtually unavailable. 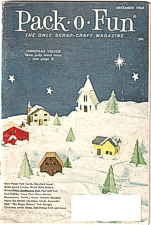 But what if you really wanted a Christmas village in 1968 and couldn't find one in the store? Recycling-oriented craft magazine Pack-O-Fun to the rescue, with a four-page feature article on how to make your own, using - of all things - cardboard meat trays. Although the overall focus in Pack-O-Fun magazine articles was on using recycled materials, I have to assume that in this case, they were recommending getting new meat trays from the butcher, not recycling used ones! Of course butchers use styrofoam today, that that's not an option for modern readers anyway. If you really want to use recycled materials for this project, consider using cereal box material. If you want to add bases (not shown in the article), you can use something thicker, like the back of a legal pad. When I first saw this article on a blog, I was amused and linked to it. Sadly, the blog has gone down, so I looked into republishing it myself. Turns out that about February, 2011, Pack-O-Fun magazine was merged into Crafts 'n Things magazine. Even more interesting, they're based about 20 miles from my house in western Ohio, not exactly a hotbed of publishing activity. When I wrote asking for permission to "reprint" this article, a nice fellow wrote back and gave me permission as long as I put the copyright notices and current web site URL on each page. The only scans we had access to were medium resolution, too small to blow up to full size without showing some digital artifacts. However, we figured that, since you have to take measurements off of the plan pages, bigger would be better. Consequently, we've "blown" up the images to print on 8 1/2 by 11" paper. We've provided a B&W and color version of the magazine's title page so you could print whichever one you wanted, or skip it entirely to save toner. We converted the other pages to black and white, to save on color toner, since it's not really needed for those anyway. Clicking on the images in the table below will give you the full-sized version of each page in PDF format. 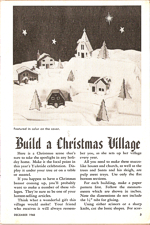 Though it may sound less than humble, the best, most detailed article I've ever seen on building cardboard Christmas houses was the one Howard Lamey helped me write. Click here to go to that page. The main things you need are a sharp blade, someplace to work without slicing up the kitchen table, and patience. Most of the plans on Howard's articles are full-sized. We haven't done that yet for this article, since it's time-consuming to get right, we just now got permission to reprint at all, and we're mostly publishing this for historical interest anyway. That said, if there's enough demand, we'll rethink that. In the meantime, if you try this project, please let us know; we'd be glad to hear from you and see any photos. And we hope you're looking forward to a great holiday season, no matter what time of year you're reading this. Cardboard Christmas - discussion forums and many articles about cardboard Christmas houses, and the hobbies of collecting, restoring, and and reproducing them. What is a Glitterhouse? - an introduction to the history of putz houses. Note: Big Indoor Trains™, Big Train Store™, Family Garden Trains™, Big Christmas Trains™, Garden Train Store™, Trains and Towns™ and HalloweenTrains.com™ are trademarks of Breakthrough Communications (www.btcomm.com). Spook Hill™, Sandy Shores™, and LittleGlitterhouses.com™ are trademarks of Howard Lamey. All information, data, text, and illustrations on this web site are Copyright (c) 1999, 2000, 2001, 2002, 2003, 2004, 2005, 2006, 2007, 2008, 2009, 2010, 2011, 2012 by Paul D. Race. Reuse or republication without prior written permission is specifically forbidden.